Strength training and conditioning are becoming necessities in today's tennis game as play continues to get faster and players hit the ball with more power from everywhere on the court. As coaches, players and parents realize this they want to get their players involved in a strength and conditioning program, often at younger and younger ages. There are a lot of questions surrounding strength training, especially when younger players are concerned. "Strength training" is synonymous with "resistance training," and the two terms can be used interchangeably. Strength training uses the principle of progressive overload to force the body (muscles, bones, tendons, etc.) to adapt in order to be able to produce and resist greater forces. Strength training is not power lifting, nor is it bodybuilding. Also, one does not need to lift weights to strength train. Many exercises can be performed simply using a player's body weight as resistance. What are the goals/ benefits of strength training? Strength training for tennis can help to prevent injury and enhance on-court performance. 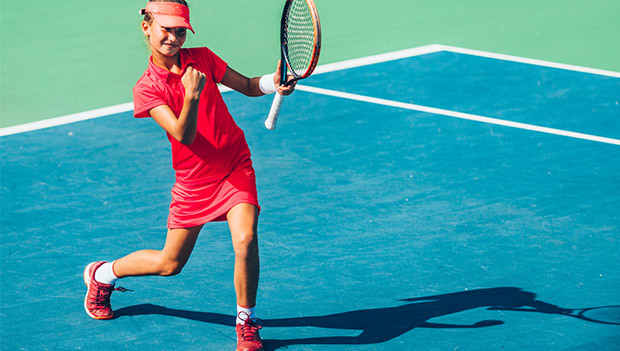 It is important for all tennis players, even young players, to strengthen the muscles of the rotator cuff to maintain a proper strength balance in the shoulder. With young players, the goal of strength training should also be to increase muscular endurance. The goals of strength training should not shift to increasing maximal strength until after a player goes through puberty. Is strength training safe for young players? The risk of injury is probably the primary concern of any coach or parent who has a child entering a strength-training program. Any exercise or activity carries with it some level of injury risk--even a child running in the backyard can suffer an injury--so it is unrealistic to assume that injuries will never occur in conjunction with strength training .